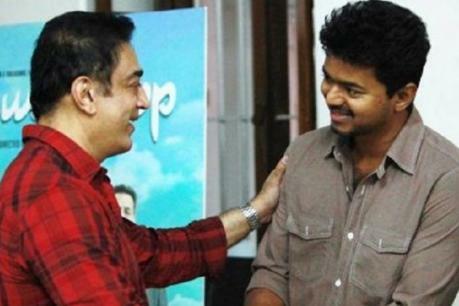 SARKAR Controversy: Kamal Haasan Comes In Support For Vijay! Thalapathy Vijay's Sarkar hit the screens last Tuesday with huge expectation is off to a record-breaking start and is doing a phenomenal job at the box-office. Apart from his huge success, the film has been in the headlines after AIADMK Ministers came out demanding to remove a scene from the movie as they claim that the scene is made in a way of mocking their government. Following the controversy, reports came out that the team has decided to remove the particular scene from the movie and the process for it is stated be under away. And now, actor-politician Kamal Haasan has come out in support for Vijay and the Sarkar movie. Roughly translating Kamal Haasan's tweet, He said, "It is not new for the government to pressurize a movie which has been given proper approval by the censor board. The government which is not ready to face criticism will fall. People who see politics as a business will be eliminated. Good rulers will always win". a®®a¯�a®±a¯�a®¯a®¾a®•a®sa¯�a®sa®¾a®©a¯�a®±a®¿a®¤a®'a¯� a®ªa¯�a®±a¯�a®±a¯� a®µa¯�a®³a®¿a®¯a®¾a®•a®¿a®¯a®¿a®°a¯�a®•a¯�a®•a¯�a®®a¯� a®sa®°a¯�a®•a®¾a®°a¯� a®ªa®�a®¤a¯�a®¤a¯�a®•a¯�a®•a¯�,a®sa®�a¯�a®�a®µa®¿a®°a¯�a®¤a®®a®¾a®© a®�a®°a®sa®¿a®¯a®²a¯� a®sa¯�a®'a¯�a®sa¯�a®sa®¿a®•a®³a¯� a®®a¯�a®²a®®a¯� a®�a®'a¯�a®¤a¯�a®¤a®®a¯� a®•a¯Sa®�a¯�a®ªa¯�a®ªa®¤a¯� a®�a®µa¯�a®µa®°a®sa¯�a®•a¯�a®•a¯� a®ªa¯�a®¤a®¿a®¤a®²a¯�a®².a®µa®¿a®®a®°a¯�a®sa®©a®™a¯�a®•a®³a¯� a®�a®±a¯�a®•a®¤a¯�a®¤a¯�a®£a®¿a®µa®¿a®²a¯�a®²a®¾a®¤ a®�a®°a®sa¯� a®¤a®�a®®a¯� a®ªa¯�a®°a®³a¯�a®®a¯�.a®�a®°a®sa®¿a®¯a®²a¯� a®µa®¿a®¯a®¾a®ªa®¾a®°a®¿a®•a®³a¯� a®•a¯�a®�a¯�a®�a®®a¯� a®µa®¿a®°a¯�a®µa®¿a®²a¯� a®�a®'a®¿a®¯a¯�a®®a¯�.a®¨a®¾a®�a®¾a®³a®ªa¯�a®ªa¯�a®•a¯�a®®a¯� a®¨a®²a¯�a®²a®µa®°a¯� a®•a¯�a®�a¯�a®�a®®a¯� a®µa¯�a®²a¯�a®²a¯�a®®a¯�. Notably, Kamal Haasan faced a similar problem during the release of his biggie Vishwaroopam and the iconic actor coming in to support a fellow actor is a welcome move indeed.